When you’re a homeowner, there’s so much to keep up with that it can seem impossible to do it all. Dealing with air conditioning and heating is probably the last thing on which you want to spend time. So, who do you call for the help with HVAC Clemmons that homeowners need? The professionals at Aspire Heating & Cooling are here to put your mind at ease. Aspire offers a wide variety of HVAC services that will keep your home at a blissfully ideal temperature. How do we make sure you stay comfortable? Repair: If it’s not broken, don’t fix it — but if it is, we will! In fact, if your A/C is malfunctioning, we’ve got you every step of the way. We’ll troubleshoot the problem, devise a solution, present you with a detailed plan, and implement it efficiently and effectively. Service: Of course, the ideal situation is to not have your A/C break down at all! Regular A/C servicing increases equipment life, improves air quality and helps keep indoor temperatures consistent. Moreover, having regular maintenance on your system usually finds issues before they become major problems. In the long run, it saves money by catching minor issues early. Summer may be lingering, but as a popular TV show once said, “winter is coming.” And it pays to be prepared! While you’re busy dusting off the decorations or doing your holiday shopping, let us take care of your heating system. Repair: A heating system on the fritz isn’t just uncomfortable — it can be dangerous. Electrical and gas issues and poor air quality can spell trouble for any homeowner. Therefore, if your system isn’t performing, don’t wait. Call Aspire today. Service: Now is the perfect time to have your heating system serviced. We’ll make sure that it’s ready for action come winter. 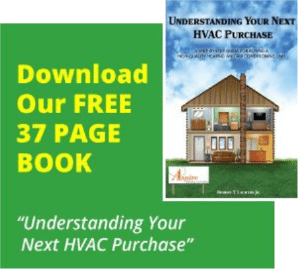 Installation: As you know, it’s tempting to keep your old heating system for as long as it will go. But, trust us — when heating systems fail, it’s not pretty! Or, if you’re a new homeowner, call us for a free consultation about your home’s heating needs. It’s hard to enjoy your home and your life when you’re not living at a comfortable temperature with good air quality. So, don’t spend one more minute worrying about your A/C or heating! With Aspire there to handle your HVAC Clemmons issues, you’re in good hands. Call us at 336-936-9111 or contact us online. Your peace of mind starts now!